Welcome to Dendera, dedicated to the goddess Hathor, the goddess of love, music, wine and procreation. 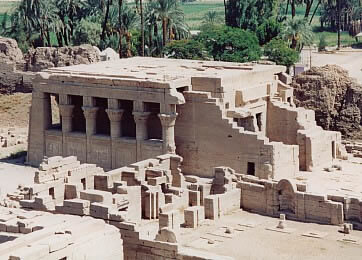 Dendera is rich in history, temples have been erected there from as early as the Old Kingdom. Located about 60km north of Luxor, Dendera can be found on the West Bank of the River Nile, opposite the modern day town of Qena. Although Dendera has been the religious site of many Egyptian periods, the present day temple is from the Ptolemic period (ie during a succession of foreign rulers named Ptolemy who adopted Egyptian cultures) and was updated during the Roman period. Amongst other structures, the site at Dendera also includes 2 birth houses (Mammisi), 2 chapels and a sacred lake. The Dendera Temple of Hathor itself stands within a mud brick wall and is one of the best preserved temples of the Egyptian periods. The main entrance into the temple at Dendera is through the outer Hypostyle Hall. Hypostyle is used to describe a hall which has a ceiling supported by columns, Hathor temple has two Hypostyle Halls.On the left is a photograph showing the facade of the outer Hypostyle Hall. 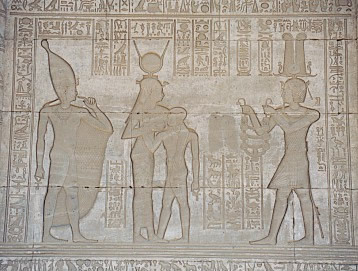 The facade is divided by six columns each of which which have four heads of Hathor engraved around them (as can be seen in the picture on the left).The walls between the columns contain images of roman emperors making offerings to Horus, Hathor and their son Ihy. 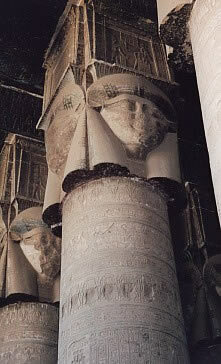 Upon entering the hall you will encounter another 18 Hathor headed columns. Although most of these columns have been damaged some are in a relatively good condition. The Outer Hypostyle Hall's ceiling is decorated with images, such as the Roman signs of the zodiac, sun-discs and the goddess Nut, whilst the walls show Pharaoh Roman emperors engaged in the act of "offerings" to Hathor. However if visitors are interested in seeing bats they should leave the outer Hypostyle Hall and venture into the inner Hypostyle Hall. The inner Hypostyle Hall leads into the "Hall of Offerings" where the priests and priestesses of the Hathor temple at Dendera used to carry out their worship. Worship in the ancient egyptian temples was zcarried out by the priests and not by ordinary people. This is because of the religious beliefs held at the time (see below). Behind the "Hall of Offerings" is the "Hall of Ennead" where statutes and gods used in religious ceremonies were stored. However the most important statue: the "Ba of Hathor" was housed in the next room which is the Sanctuary. The "Ba" was believed to be the being's personality and was depicted as a bird or a bird with a human head. It was also thought that at the time of death the Ba left the body but would return to its owner's tomb every night. Just in case the mummy was lost the Egyptians would make a statute for the Ba to return to. The Sanctuary also contained statues of Hathor and Horus, all of which would be cleaned, had their clothes changed and offered food and drink daily by a priest. On special occasions these statutes may have been taken outside for the ordinary people to see. The sanctuary is surrounded by 11 chapels which were used to store religious items, including those used for the new year festival. At the Annual New Year festival statutes were moved around the temple:the most important being the statute "Ba of Hathor". The Ba statute was taken in it's shrine to the roof of the temple and carried on a barge up the river to visit her husband the God Horus at his temple in Edfu. Ancient Egyptians did not hold modern day theological and religious beliefs, instead religion was based around interaction with Gods in the hope that such interaction would encourage the gods to treat them favorably. This interaction, manifested itself in three forms: doing things, thing done or regular procedures. Such interactions are known as Cults and temples were designed in a manner that would facilitate and cater for cults. One such feature in Hathor temple are chambers that have storerooms and staircases known as Crypts underneath them. These Crypts served many functions including acting as a safe haven for the treasures of the temple, protecting from any external harm/enemy and containing important religious objects. In the temple grounds there are two birth houses and a temple dedicated to Isis; The Isis temple is small and simply contains a sanctuary, two side chambers, a relief of Bes and a niche which used to house a statue of Osiris. 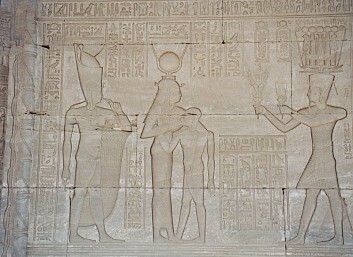 The walls contain images of Hathor suckling a child and images of Hathor in the form of a cow.The Roman mamissi was built by Augustus and has reliefs on the exterior walls showing the birth and childhood of the infant Horus. 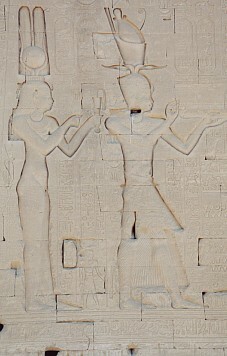 There is also a relief of the Pharaoh making an offering to Hathor who is suckling her young son Ihy. The second birth house, believed to be 200 years older than the temple was built by Nectanebo I and celebrated the birth of the young god Ihy, the son of Hathor and Horus of Edfu.The theme surrounding birth is further portrayed through various images of god Bes (protector of women during childbirth) at points throughout the temple and its grounds. Bes had a grotesque appearance to ward off evil spirits at the moment of birth. On the left there is a picture showing Dendera and its various structures including the flat temple roof. Dendera is the only temple which has an accessible roof top to the public; the views are outstanding. As stated above, temples were designed to facilitate cults so access to the roof was constructed to enable religious activities. 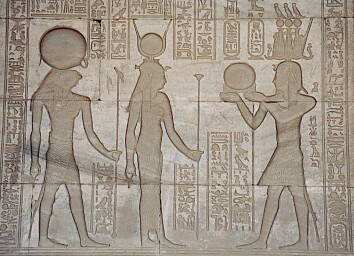 Each year images of Hathor would be taken to the roof each year for communion with the sun god Re. On the roof there are also two mortuary chapels dedicated to Osiris. One of these chapels contained a solar disc illustrating Osiris' journey into the netherworld, but this is now a replica as the original is moved to the Louvre. 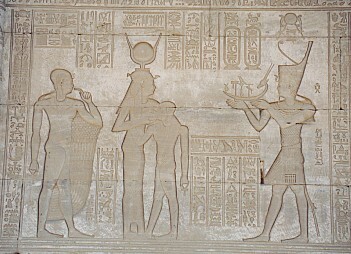 As the Egyptians believed that Hathor could heal them, they visited the temple for various dream treatments. In the grounds of the Temple you will find a Sanatorium, designed to accommodate and treat pilgrims visiting the temple. In this respect the Sanitorium was a type of hospital but medical techniques were very different to those practiced today. Amongst other treatments narcotics were used to induce healing dreams. In her earliest days Hathor was worshipped as the cow goddess so images of her, can be that of a cow or a woman with the ears of a cow. 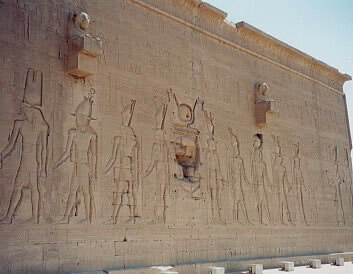 As a result Dendera contains burials of sacred animals especially the cows associated with the cult of Hathor. Hathor was also closely identified with Ra the Sun God so there are other images of Hathor wearing a wig, horns and a sun disc. Hathor was also said to be the mother of the Pharaoh and as this can be seen in the photograhs at the bottom of the page which show various reliefs including one of Hathor suckling her young son on the walls of the roman mamissi. Even the Greeks adopted Hathor and identified her to Aphrodite their own goddess of love and joy. The left photograph on the right shows the rest of the wall. The wall conatins a scene from the festival of "Raising the Sky". The structures at the top of wall are Lion - headed water spouts which were used to drain water from the temple roof.